Over the past month I have been on the search for the best makeup finisher set. Being the frugal person I am I decided to make a wise decision and not splurge on a bunch of different things that would most likely irritate my skin. Therefore I just purchased one "high end" finisher and a "low end" finisher. For my high end finisher I chose MACs Fix+ and for my low end I went with e.l.f's Makeup Mist and Set Spray. Overall I like both of them but let me breakdown my thoughts on each of them. I purchased this product from the MAC counter in my local mall. It took me a while to decide on this purchase as the standard size was about $28. I really didn't want to pay that much not knowing what kind of results I would yield. Surprisingly enough when I went by the checkout counter, I noticed this wonder travel size. The travel size is a 30ml bottle and I payed $10.00. It may sound weird but the best thing I like about this product is its container and appearance. As you can see in the picture it is a very small bottle but the plastic is very sturdy and clean and sleek. The black top is the best! You can actually lock it at the top from spraying out by twisting the bottom. You wouldn't even know it was spray at first glance. The bottle is also a firm hold and as far as I can tell you cannot unscrew the top easily so that protects from accidental spill outs that could occur during traveling. There really isn't a distinct scent but I wouldn't say it is scentless. It's hard to say. The spray at first seem light but that was only because I had not used another spray to compare too. Now I think the spray is somewhat heavy. I try to spray from an arms width away from my face to ensure my face is not soaking wet however still evenly coated. Typically it takes about 1 minute to dry once applied. I waited for a while before I tested to see if it really would make my makeup last. I found that it does protect my makeup however it does not mold it as well but instead it gives me a shinny glow. I wasn't really feeling the shinny glow. I thought maybe I was not applying it correctly, maybe not using enough or using too much. So I decided to do some research and I learned that this specific spray was not designed to set or mold your face so it shouldn't be expected to contribute to long lasting makeup wear. Regardless of its true purpose, I still think it did a good job as only minimal amount of makeup came off when I tested it. I continue to use this product but when I use it, I defiantly use a small amount and I pat my skin after it drives to reduce the shinny look. If I could make a suggestion to MAC regarding this product I would say, provide the ingredients of the "fix" product on the bottle. You all know I love LOVE e.l.f products! When I saw they had a set spray I had to grab it. After all, it was only $3. I purchased this spray from my local Target. The packaging or spray bottle is nothing to write home about. It is a 60ml bottle so that is a good size. Exactly double of the MAC Fix+. The bottle is sturdy however it is simple. The thing I did not like about the spray is the fact that it was a traditional twist on twist off spray pump bottle. This leaves room for many possible accidents while traveling. Don't get me wrong, it does have a top but I am not good with tops so the probability of me loosing the top is high. The main ingredients in this spray is Aloe, green Tea, Cucumber, Vitamins A, C,& E! Lot's of good stuff right? I was a bit hesitatnt to use it after I saw cucumbers listed because typically anything infused with a cucumber scent will break me out but I had no problems with the set spray. The spray does have a scent of Aloe Vera & Cucumber to it. It's hard to pin point it to one thing. 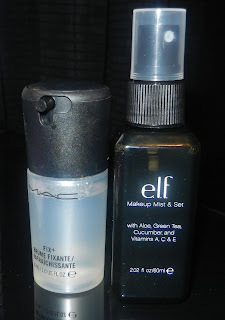 I applied this spray the same way I applied the MAC Fix+ and I must say I love it! I had no issues at all with it. It coated my skin very well, and the spray was very light. When I did the test wipe, I had a VERY VERY small amount of makeup come off. Also this spray does not give me an oily shinny look which is great! If I am in a rush and I expect to have a long day, I know I can count on this e.l.f. make mist & set to have my face, i mean BACK for the entire day! What works for my skin and face may not work for yours so I encourage you to try it out yourself! If I had to pick one over the other, it would be the e.l.f mist and set as you cant beat that price and it truly does a better job overall! What is your favorite makeup finisher, set, or fix? I'll def have to try e.l.f mist out! Sidenote I've gotten so many compliments on my earrings that you made today :) Loving them Faith!! Yea girl it's only $3 and you can't beat that! I just read Charla's post about the lip colors from wet 'n wild! I am going to check their selections out! Glad u liked them, it's time for me to do some new ones!